On Saturday May 12, Sunrise Division's annual contest for Barbershop-style choruses and quartets took place in Kentville, NS. Men of Fundy had a lot to lose after last year's excellent results. This year, Men of Fundy retained their hard-won title of Best Small Chorus (choruses with less than 30 members), and also finished 2nd overall, missing the top spot by only 2 points out of 380. We heartily congratulate the Sydney NS chorus, the Cape Breton Chordsmen, who won that top spot. The chorus receiving the appreciation of the audience at the end of their performance. L to R: George Smith, Tim Curry, Harry Cross, Glen Cosman, Bob Ellis, Dave Hansen, Al McPherson, Duncan Mugford, Rod Graham, Ken Creighton, John Wright, Mark McGillivray (seated), André Welland, Grant Clark, Mike Brown, John Backa. Standing in front is Director Janet Kidd. 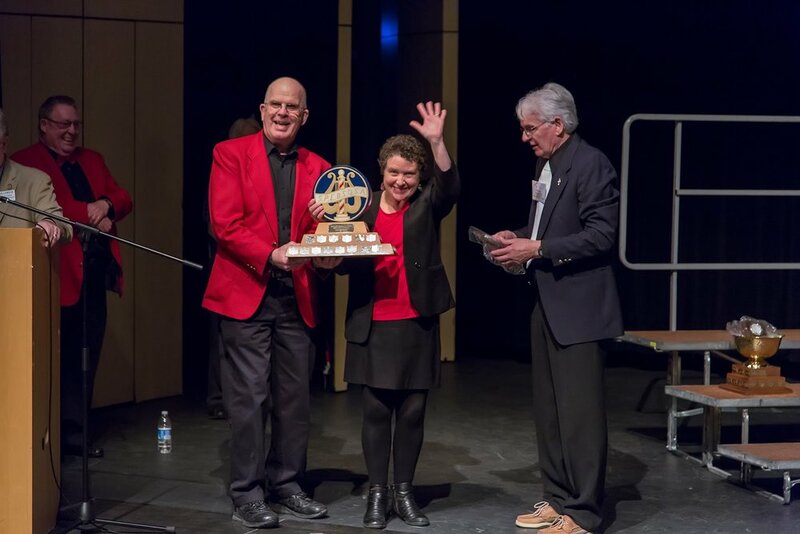 André Welland (President of Men of Fundy) and Janet Kidd (Director) receiving one of the trophies won by Men of Fundy at the recent Sunrise Division annual contest.